The 1930-1945 comedy soap opera “Easy Aces” was created by former newspaper film and drama critic Goodman Ace, who gave his domestic drama a recurring newspaper reporter character and several journalism subplots over the years. Ace’s reporter, Neal (or Neil) Williams, was introduced as the boyfriend of the Aces’ border, Marge. At one point he turned the malaprop-prone Jane Ace into a correspondent for the paper — ghostwriting stories under her byline after she and Ace became involved with a movie star on the run. Goodman Ace was author, producer and co-star in more than 1,500 episodes of “Easy Aces” — as well as author of several books, columnist for Saturday Review, and head writer for Danny Kaye, Milton Berle, Perry Como and others. The fictional “Mr. Ace” he played on radio was not a writer, although at one point in the storyline, he wound up working at the newspaper — in real estate advertising, with newsman Williams’ help. The reporter’s involvement with his friends the Aces led to other plots: In one, he tried to promote fights for a boxer friend of Jane’s; another time, he covered-up a shooting at the Aces home involving a publicity stunt for his newspaper. It also involved discrediting a scoop in the opposition paper. “He scared me out of my half-wits,” Jane admitted. Neal: “About this story running with your byline, with your name, ‘by Jane Ace.’ You don’t write that, I do. I write the stories, then I sign your name to them. Jane: “Why Neal, that’s perjury isn’t it. Actual journalists in the listening audience must have enjoyed writer Goodman Ace’s way with words. As for Williams, he showed a lot of enterprise for a small-town newsman. Thanks to the movie star stories in his paper, he had offers for follow-up stories: A movie magazine wanted Jane’s diary, a women’s magazine wanted an article, and another Hollywood journal called while Jane was in his office. “It’s a big chance for me to pound out a lot of yarns and peddle them around with your byline. Ace: Well I guess this kind of stuff makes good reading for movie fans. It must or they wouldn’t devote this much space to it every day. But as far as I’m concerned it’s a new high in lows. Marge: Yes, it is a little maudlin… Give Neal a subject like this and he’ll spread more adjectives to the square yard than any man I know. While often skating on the thin-ice of purple prose or conflict-of-interest, Williams did some serious reporting when Ace lost his savings in an insider real estate deal. In typical “Easy Aces” fashion, the deal had fallen through partly because the usually dizzy Jane Ace did a better-than-expected job of handling publicity for opponents of a public housing development, not knowing her husband was the silent partner. Journalism students may find some lessons there concerning the effectiveness of publicity campaigns. Ace’s business failure led to a story arc (Episodes 134 through 150) that eventually put Williams to work on a more serious investigative assignment — and actually made him the lead character in the series. The Aces, having lost their money in that crooked real estate deal, were tricked by Aces “friend,” the crooked alderman and developer, into leaving for a job in the Southwest — so that Ace could not be called to testify in an investigation. 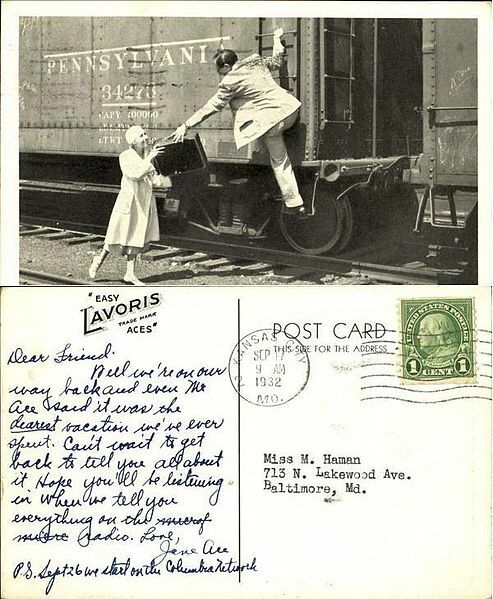 While the Aces were out of town, communicating by letter and postcard, a journalist became the hero of their series. Rather than follow the Aces to their new location, the radio serial stayed in their old hometown, had friends and family read cards and letters from them as part of the plot, and had Neal gradually uncover the real estate scandal. By the end, he had recovered the Aces’ money — and the real-life Jane and Goodman Ace two or three weeks away from the broadcast. In the Neal Williams episodes, the reporter correctly suspects crooked alderman Tom Marsh of planning a double swindle, using clueless silent partner Goodman Ace’s investment to purchase land, then sell it to the city at an inflated price as the site for a public housing project. The accusation gets the reporter fired by his editor, who believes the alderman is honest, but an accidental dictaphone recording leads to a happy ending. The high-technology of their day, recording machines often played a part in movie and radio plots in the 1930s and 1940s, long before the Nixon White House tapes played a similar role in the Watergate case. Coincidentally, Martin Gabel, the actor who played this investigative reporter on “Easy Aces,” later had a role in one of the best newspaper movies, Humphrey Bogart’s “Deadline U.S.A.,” but on the other end of investigative reporting — as the politician-corrupting gangster who is the movie’s main villain. In this sequence of “Easy Aces,” however, Gabel’s character is on the side of journalistic truth and justice — if not complete objectivity. Getting back his friend Aces’ money is an important part of reporter Neal Williams’ plan, working with the Aces’ niece Betty, her boyfriend Cokie, and Williams’ girlfriend Marge. According to an OTRRpedia Easy Aces cast list, Neal (or Neil) was played by actor Martin Gabel, who also appeared on radio as a member of Orson Welles’ Mercury Theater and was among the cast of “The March of Time,” Time magazine’s radio “newsreel” that dramatized reenactments of news stories. In well-known newspaper movies, Gabel didn’t return as a reporter, but in addition to playing the gangster villain of “Deadline U.S.A.” (1952) with Humphrey Bogart, he had the part of ill-fated psychiatrist Dr. Max Egelhoffer in the 1974 remake of “The Front Page” with Jack Lemmon and Walter Matthau. Ace’s biography there notes that he launched his writing career as drama and film critic at the Kansas City Post in 1919. His radio career began in 1928, reading his newspaper columns on the radio, which opened the way for “Easy Aces.” He was eventually supervisor of comedy for CBS and established its school of comedy writers, as well as writing for several major television series.